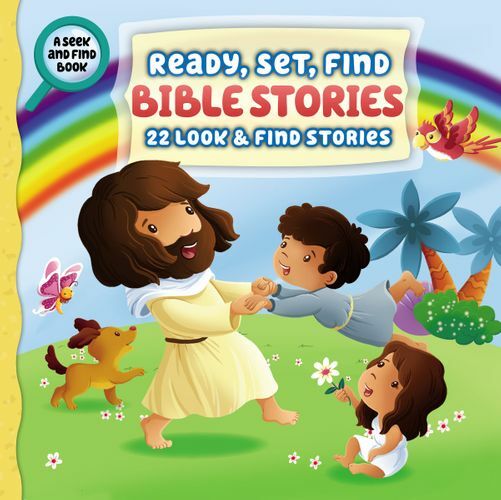 Get ready to read through 22 of the most famous Bible stories in the Ready, Set, Find Bible Stories, part of the beloved Ready, Set, Find brand. The padded board book is perfect for little hands, and parents will love the scripture callouts at the beginning of every story. Children will be immersed and engaged in each story as they look for more than 190 different objects to be found in this exciting look-and-find book. Featuring classic stories from the Old Testament and New Testament, including the Creation story, Noah and the Ark, the birth of Jesus, and more, this lively and colorfully illustrated storybook Bible is sure to be a favorite for young readers to ready, set, find!